We have a deck that sits anywhere from four to five feet above ground. Sitting on the swing, looking across the deck and out over the back yard is a common way to pass time around here. For privacy and some shade, a couple of years ago we planted two clumps of Bambusa chungii ‘Barbellata’. They have grown to about twenty feet or so tall now. Their rapid growth had made it even more tempting to pass time by watching the bamboo sway and listening to the cardinals. 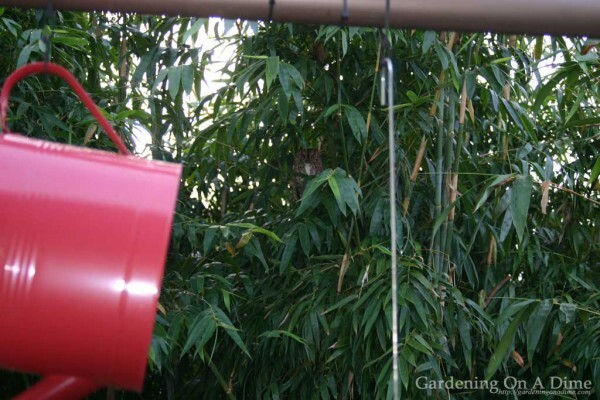 The cardinals love to set up nests in the ‘Baby Blue’ bamboo (the common name for this type of bamboo). The birds are not messy and their chirping at dusk let’s me know it’s time to pack it in for the day. A few days ago, I noticed that about six feet off the ground, some of the Barbellata’s leaves were wet looking and had white spots on them. Remember, I’m sitting about twenty feet away, across the deck. Bird poo? Not from the cardinals. So, I continue to sit, swing and relax. Thinking maybe it is bird poo, what’s there to do?……look higher up the bamboo. That’s when I saw a darker area inside the culms (the things that many folks call stalks). Ok, now we need to stand up and take a closer look. 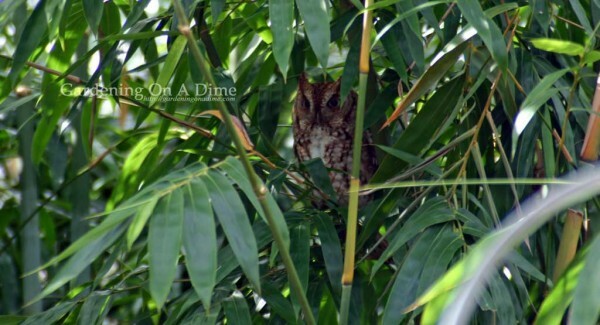 To my surprise, this little brown owl is staring right at me. That darker area in the culms? Question answered. I grabbed the camera and took a few shots to research later. Confident birds, they are. I was able to walk to the edge of the deck, almost eye level. 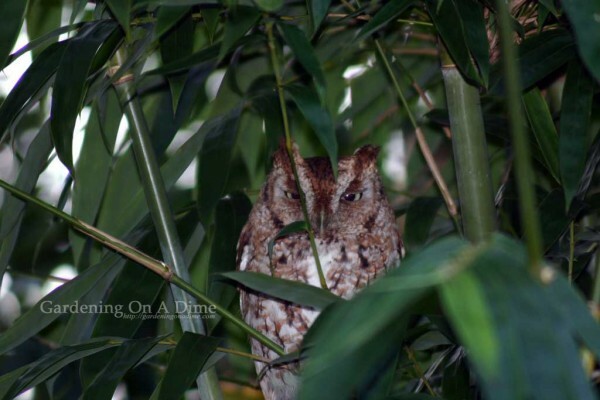 No more that six feet away, this owl calmly sat and watched me. After the “photo shoot”, I went back to the swing and watched this motionless bird for quite a long time. We had several staring contests and he (or she?) always won. Eyes partially open, constantly aware of every movement. It was kind of weird to get up and walk past Howard. (I named him Howard, don’t ask why, I don’t know.) He follows your movements. Owls turn their heads, and don’t move their eyes. A dog follows you with their eyes. Seeing a head turn when you go by…..you begin to think he knows more about you than you know about him. Staring………….all day long. I thought they were supposed to be sleeping! Now I was even more curious about who Howard really is. I used the pics taken earlier to match up with search results. 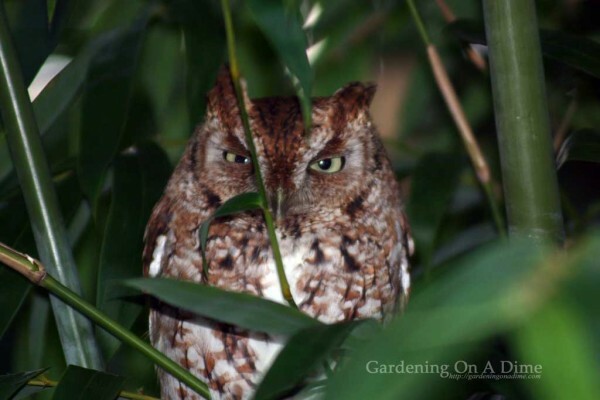 Best I can tell is that Howard is an Easter Screech Owl. Brownish, eight inches tall, very cool looking, an aura of confidence, fearlessness and also calmness. Sounds like Howard. No nest is in the Baby Blue, as he has just been hanging out with us. He was here all day for two of the last fours days. Exactly at sunset, he stretched and preened his wings. Then, ten minutes after sunset, he flew out from inside bamboo to either the top railing of the deck or a smaller culm on the edge of the clump. He perched a minute or so, turning his head and scoping things out. Then, off for the night, he flew away. In the process of trying to find out what Howard is, I found some plans for building owl boxes. They seem pretty easy and cheap to build. Mounted correctly and given proper squirrel deterrents, it is possible with a little luck, to have your own backyard owl family. Here is one of the many basic plans I found for this project. 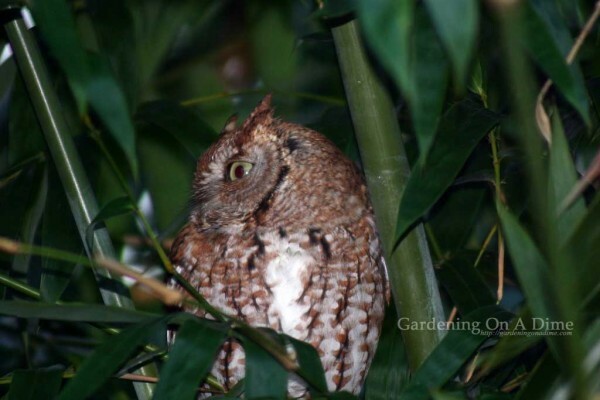 This one came from http://www.shawcreekbirdsupply.com/plans_screech_owl.htm. I clicked around Shaw Creek Bird Supply’s website. They have a nice selection of houses, feeder and bird baths. It’s nice that they offer free plans for bird houses, considering that’s what they sell! 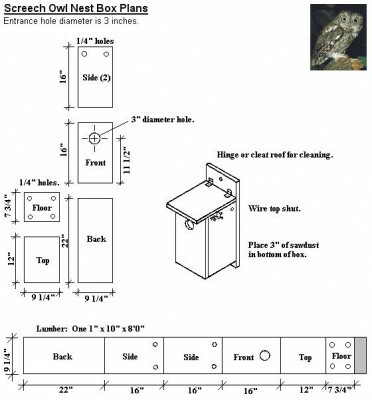 I found some good tips on mounting an owl box at mdconline ( the Missouri Department of Conservation). They also have a nice PDF with instructions and plans. You can view it at: http://mdc.mo.gov/sites/default/files/resources/2010/05/4639_2386.pdf. Owls set up camp from March to May, so it’s a good idea to get your box built and mounted before breeding season starts. Fall and winter will be the time to take down your owl box for maintenance and cleaning. Only after you are sure though that the owls are not there! Howard didn’t return this morning. If he comes back tomorrow or the next day, I know it will be pretty cool to have him as a neighbor. If not, so be it. His presence was enjoyed for as long as it lasted. To see a wild bird so comfortable in our own backyard……..it’s a nice feeling to enjoy while sitting on the deck, relaxing and swinging on the swing. One more thing. Never call Howard Howie. It’s HOWARD……said with straightened tie, upper crust distinguished confidence. Because Howard is cool! Indeed he is. Sadly, Howard has been gone for a couple or three days. 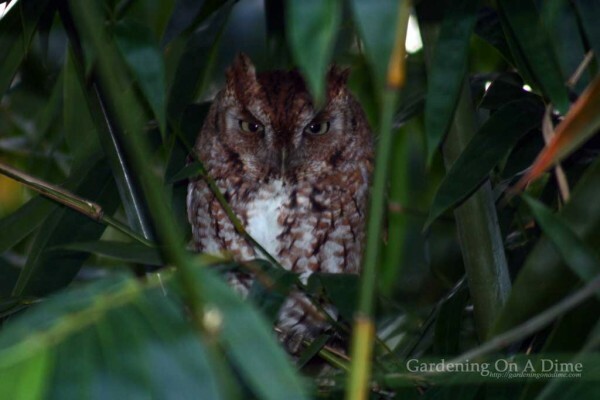 But while looking for Howard, we discovered Harriet watching us on the opposite side of the same clump of bamboo! I think Howard is still around. He’s just being extra cool. Breaking Update! Trish just told me that she saw Harold today, but not Harriet. Hmmmm?